The Dutch band celebrates 12 years and four successful albums with their biggest concert to date. Although female-fronted symphonic/goth metal is insanely popular in Europe -- nearly every country on the continent has seemingly produced a prominent band -- the Netherlands has cornered the market like no other, producing four of the genre's best-loved acts. Of course, the groundbreaking Gathering helped start it all in the mid-1990s, while both After Forever and Epica have taken the sound to bombastic, operatic heights in recent years, but it's the rather straightforward sextet Within Temptation that's easily the most popular group. Not surprising, either, as not only does the band rely on a very accessible, streamlined, pop-oriented formula, but in singer Sharon den Adel they have a rare metal frontwoman who can hit the high notes like any other mezzo-soprano diva, but also can shift instantly into straightforward pop singing as well. Toss in the fact that the band is capable of some of the hookiest metal singles of the past decade, as last year's marvelous The Heart of Everything attests, and you've got a package that can appeal to a wider audience than the majority of their peers. 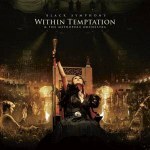 The Heart of Everything charted in the top ten in seven European countries and at the top at home, so Within Temptation was afforded an opportunity that only the most commercially successful bands have: to pull off a gigantic, lavish, one-off show in celebration of their 12-year career. And for their February, 2008 concert at Rotterdam's sold-out Ahoy arena, they pulled out all the stops, incorporating the 60-piece Metropole Orchestra, a 20-person choir, a dazzling stage setup, a blinding array of pyro, Cirque du Soleil-style stilt-walkers, an extravagant wardrobe for den Adel, and a full audio and film crew (including 14 HD cameras) to document the entire spectacle. Incredibly, everything went off without a hitch, and what we're left with is a mighty impressive CD/DVD combo that does this fine band justice. While the CD on the North American version gives listeners only 13 of the concert's 22 songs (at 68 minutes, curiously not taking advantage of the full capacity of a CD), the fact that the DVD contains the complete show more than makes up for the truncated first disc, and the entire performance is dazzling from start to finish. In typical metal fashion, absolutely everything is done full-tilt, starting with the fittingly titled opening orchestra piece "Ouverture", which carries on for an ungodly, but deliciously ornate seven and a half minutes. After kicking things off for real with the rousing symphonic stomp of the 2005 single "Jillian (I'd Give My Heart)", the band and their 80 accompanists hunker down, devoting the bulk of the set to The Heart of Everything, playing ten of the album's songs in total. In spite of his over-the-top intro, conductor Jules Buckley never lets his orchestra overwhelm the band's actual songs. His arrangements may be epic in scope, but they're always tasteful, as evident on heavier tracks like "The Howling", "Stand My Ground", and "Our Solemn Hour". Within Temptation has always displayed a tendency to overplay the ballad card a few times too often, and true to form, the set hits a bit of a speed bump midway through, as den Adel and a string section slogs their way through four turgid tunes, but a duet with former Gathering singer Anneke van Giersbergen on "Somewhere" is nevertheless lovely. The full-blown power ballads, on the other hand, are superb, as "The Cross", "Frozen", and "All I Need" show just how much the band has perfected the craft. Late in the set we're treated to a bevy of older tracks from past albums like Mother Earth and The Silent Force, highlighted by a terrific beauty-and-beast duet between den Adel and growler George Oosthoek (from Dutch death metal veterans Orphanage) on "The Other Half (Of Me)", the symphonic metal epic "The Promise", and their 1997 breakthrough single "Ice Queen". The mix on the CD is excellent, considering all the instruments that were recorded. The surround mix on the DVD is unspectacular, and the video does sometimes tend to be rather epileptically edited and a little too reliant on such bells and whistles as slow motion effects and pointless monochrome interludes. But thankfully, it's not enough to distract from the overall show, as director Hans Pannecoucke gives us terrific glimpses of the band, the orchestra, and the enraptured audience. The extras are spartan, but very nicely done, serving up behind the scenes views from three different perspectives. In all, a classy package befitting a very classy band, and a sure-fire fan pleaser.